This week, I’ll be discussing breads that use a simple and ancient way to improve the flavor and texture of your finished loaf. All these breads will use what’s called a “pre-ferment”, which just means that you make a little bit of dough in advance, and add it to the remaining ingredients to make the final dough. You may recognize the technique as called a “starter”, like when you make sourdough. Before yeast was really understood, using a bit of dough from a previous batch of bread was a common way to introduce the yeast into a bread. 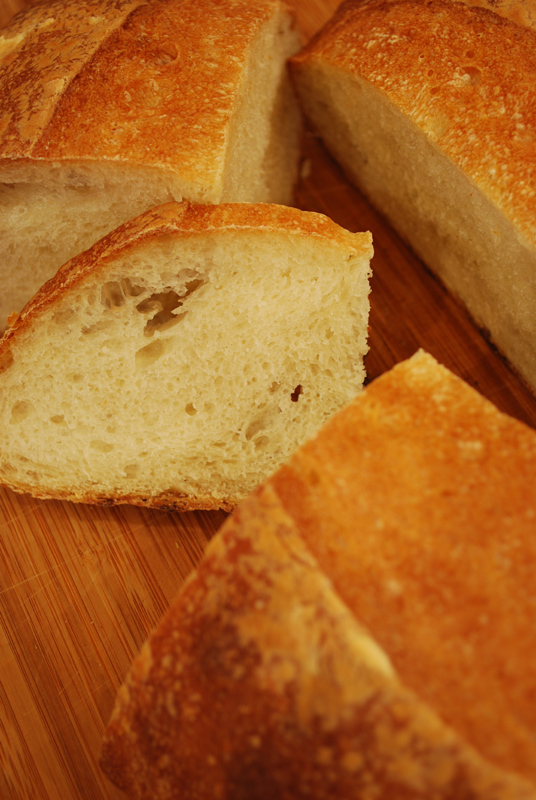 But not only does a pre-ferment help with yeast production, it also vastly improves the flavor of your bread. In order to understand why, you have to understand fermentation a little. Fermentation, also known as the first rise, is when the yeast cells start to feed and reproduce. When they feed, they create organic acids, called acetic acid and lactic acid. These acids are important flavor compounds, as well as strong dough conditioners that help strengthen the gluten and form it properly. So these acids are good here; we want them to develop, and that takes time. But if you let a standard dough sit too long, the yeast multiplies too much, releases too many gases, and will eventually break the gluten structure, just like blowing up a balloon until it pops. Therefore, we want to slow them little yeasties down. This is why a pre-ferment generally has very little yeast added, and/or is put in the refrigerator (cold will retard yeast activity, but still allow for the acids to develop). So, then, why don’t you just make any type of dough, stick it in the refrigerator, and call it a day? Well, long story short, any other ingredient will get in the way of the yeast doing its thing, and making those acids. That means don’t add any salt, sugar, milk, butter, or anything else; just water, flour, and yeast. The yeast knows what it’s doing, don’t let anything else interfere! Now, there are many different types of pre-ferments, and I’ll hit on the basic types throughout the week, but I certainly won’t be able to hit them all. The main difference between them all is the amount of water compared to the amount of flour (aka: level of hydration). Generally speaking, the more water in a pre-ferment, the faster the yeast will multiply; therefore, you treat them all a little differently, based on how fast or slow you want the yeast to grow. The bread today uses a pre-ferment called a “biga”. This is an Italian starter, and is usually fairly firm (about 50% hydration). This one is best when fermented over long time in cool environment (like a refrigerator). Bigas tend to be more stable and keep longer at their peak than do other, more liquid pre-ferments. This recipe, from Cook’s Illustrated, is one of my treasures, and marked a clear change in the quality of bread I bake. When I started making bread, there was a sharp distinction between the homely, somehow soft and dense loaves I produced and the airy, crisp-crusted beauties I had seen in stores. This recipe changed all that. Because of this recipe, I can now produce bread that I am quite happy to admit that I made with my own two hands. The article accompanying the recipe beautifully and thoroughly delved into the science behind a great loaf, and helped me understand what I was actually doing when I mixed flour and water. But wasn’t it all a bit… daunting? Yes, every step was clearly explained, and seemed simple enough; but who could spend 6 hours of the day waiting on this bread, when one could just try any number of other, faster recipes? But the promise of an authentically rustic Italian loaf made me hold onto the ripped-out pages, waiting for the right time. I was tempted, plain and simple. Finally one weekend, I went out and bought my now-invaluable scale* to weigh the ingredients properly, as the amounts were given in ounces, not cups. I began the time-consuming chore, counting exactly the hours in between tasks, taking care with every step, being certain not to disrupt the satiny dough. I patiently and a bit nervously performed the necessary steps as directed. This was not the bread I was used to making. But when I pulled those first beautiful loaves from the oven, I was sure I was onto something good. After allowing time for them to cool (always the cruelest part), I grabbed a serrated knife. Slicing through the crust made it shatter onto the counter in tiny shards. My previous attempts at bread had never done such a thing. A faint wisp of steam carried the scent of the warm interior to my face. It smelled perfect. Inspecting the cross-section revealed the airy holes and soft webbing of a properly-made bread. Dipping my creation into a dish of olive oil, I tasted it. Had I really made this? It tasted like it was from the best bakery in town! Crunching through the crust into the chewy interior, I knew I’d never be satisfied with making a lesser bread ever again. Success! So what’s with the name? My brother-in-law came to like this bread so much, that he would ask me to make it as often as I could manage. Not sure what to call it (its given name, “Rustic Italian Bread”, being a bit unwieldy), he started requesting “that good bread”. Which then became “Good Bread”, which was then further shortened to “G’Bread”. And now you know. Yes, it’s time-consuming, but each step is fairly simple. And boy, is it worth it. * – As I may have mentioned previously, I find a scale crucial in baking. You can measure a cup of flour ten times and get ten different amounts, but one ounce is always one ounce. And it certainly doesn’t have to be expensive or fancy; I think mine was around ten dollars, and is a tiny plastic thing. 1. Combine flour, yeast, and water in bowl of standing mixer fitted with dough hook. Knead on lowest speed until it forms a shaggy dough, 2 to 3 minutes. Transfer biga to a medium bowl, cover tightly with plastic wrap, and let stand at room temperature until begining to bubble and rise, about 3 hours. Refrigerate biga at least 8 hours, and up to 24 hours. 1. Remove biga from refrigerator and let stand at room temperature while making dough. Combine flour, yeast, and water in bowl of a standing mixer fitted with the dough hook; knead on lowest speed until rough dough is formed, about 3 minutes. Turn mixer off, and without removing dough hook or bowl from mixer, cover bowl loosely with plastic wrap; let dough rest 20 minutes. 2. Remove plastic wrap, add biga and salt to bowl, and continue to knead on lowest speed until ingredients are incorporated and dough is formed (dough should clear the sides of the bowl but stick to very bottom), about 4 minutes. Increase speed to low and continue to mknead until dough forms a more cohesive ball, about 1 minute. Transfer dough to large bowl (at least 3 times dough’s size) and cover tightly with plastic wrap. Let dough rise in cool, draft-free spot away from direct sunlight, until slightly risen and puffy, about 1 hour. 3. Remove plastic wrap and, using a broad nonstick spatula, fold the dough over itself, as though you were folding a letter: 1/3 over the center, then the opposite 1/3 over that. Lastly, fold dough in half again, perpendicular to the first folds (like you’re folding the letter in half). Dough should end up being roughly a square. 4. Replace plastic wrap, let dough rise 1 hour. Turn dough again, following above procedure, then replace plastic wrap and let dough rise 1 hour more. 5. Dust work surface liberally with flour. Gently scrape and invert dough out of bowl onto work surface (side of dough that was against bowl should now be facing up). Dust dough and hands liberally with flour, and using minimal pressure, push dough into rough 8 by 10 inch square. Gently roll up dough, using long edge, and pressing seam to seal as you roll. Tansfer dough to a large sheet of parchment paper. Dust loaf liberally with flour and cover loosely with plastic wrap; let loaf rise until doubled in size, about 1 hour more. Meanwhile, adjust oven rack to lower-middle position, place baking stone on rack, and heat oven to 500º F.
6. Using a sharp serrated knife, cut a slit 1/2-inch deep lengthwise along top of loaf. Spray loaf lightly with water. Slide parchment sheet with loaf onto baker’s peel or upside-down baking sheet, then slide parchment with loaf onto hot baking stone in oven. Bake 10 minutes, then reduce oven temperature to 400º F, and quickly spin loaf around. Continue to bake until deep golden brown, and a thermometer inserted into center of loaf reads 210º F, about 35 minutes longer. Transfer to rack, discard parchment, and cool loaf to room temperature, about 2 hours. 1. I made G’Bread this time into one big loaf, as the orginal recipe instructs. But typically, I cut the dough into 3 or 4 smaller loaves (even into little dinner rolls sometimes), and it works just beautifully; in fact, I think it works better. You end up with a more airy crumb in the bread, and there’s not as much danger of overcooking the exterior before the inside is completely done. I think maybe the mass of the whole recipe of dough is a little much for the yeast to raise, compared to a smaller loaf. 2. If you don’t have a baking stone, turn a baking sheet upside down, and let it heat up with the oven. You get a much better crust that way! 3. I’ve never tried making this by hand; nor do I recommend it. The dough is a little too wet to handle on its own, and you would run the risk of adding too much flour if kneading by hand. I hate to say it, but this one really does require a stand mixer.